You are at:Home»January»January 19»January 19, 1913: Haunted Hotel Burns! January 19, 1978: Haunted Hotel Burns Again! January 19, 1913: Haunted Hotel Burns! January 19, 1978: Haunted Hotel Burns Again! On January 19, 1913, the Holly Hotel in Holly, Michigan burned for the first time! Called “the most haunted historic building in Michigan” on the hotel’s own website, the Holly Hotel burned again 65 years later to the day and hour! Digging deeper, we find many more reasons for the “haunted” reputation of the Holly Hotel. Historic Holly Hotel. Photograph by Andrew Jameson. The haunting has been confirmed by numerous investigators such as Professor Norman Gauthier. Photographic evidence and the sheer volume of persons reporting ghostly phenomena are hard to casually disregard. Many people unfamiliar with the history of the hotel or the previous reports of spiritual manifestations (which include apparitions, smells, sounds and music) are shocked when they find out other people have experienced the same creepy events! Also, since the hotel was built in 1891, this paranormal activity has been going on consistently for a long time. Host to many notable people such as George H. W. Bush and notable comedians who perform at its comedy club such as Bill Maher, the Holly Hotel has even hosted the Detroit Red Wings, a professional ice hockey team, after they won the Stanley Cup! The Holly Hotel website brags that the Broadway actor Joel Grey said the Holly’s restaurant is the equal to any in New York. Carry Nation, that crusader for “temperance,” visited the Holly Hotel in 1908, but she did not come for the food, lodging or entertainment! She came, along with her like-minded, intolerant, anti-alcohol mob, to beat the hotel’s bar patrons with her umbrella. Not surprisingly, management disapproved of her actions and had her arrested. Nation with her hatchet in 1910. Photograph by Philipp Kester (German photojournalist, 1873-1958). If you need a place to stay in southern Michigan and do not mind any of the following: ghosts; the smell of non-existent cigars and ghostly perfume; objects moving of their own accord; phantom dogs brushing against your leg; mysterious disembodied giggling; and music coming from nowhere, you might want to try the Holly Hotel. The top notch food and entertainment could help you overlook the pesky ghosts, or perhaps you are coming to do a little research of your own! Question for students: Have you ever been on a paranormal investigation? If so, please let us know where and when in the comments section of this page. 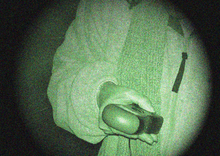 A ghost hunter taking a reading with an EMF meter. Photograph by LuckyLouie. Haggart, G.P. and Nancy Haggart. The Ekballist. CreateSpace Independent Publishing Platform, 2012. Hunter, Gerald S. Haunted Michigan: Recent Encounters with Active Spirits. Thunder Bay Press Michigan, 2000. Lyons, Sandy Arno, Dr. Susan Richardson, et al. Michigan’s Most Haunted, A Ghostly Guide to the Great Lakes State. SkateRight Publishing, 2007. Next Article January 20, 1885: Scream! Roller Coaster Patented!